Get a jump on Valentine ideas! One thing that most Disney Fans have in common is our love of the goodies you can get while at a Disney Park. I know that there are certain treats that I wish I could get any time of the year. Maybe I wouldn’t enjoy them as much if I had them all the time, but I’m willing to risk it! Valentines Day is fast approaching, and eating yummy treats goes hand in hand with that holiday. We can’t have Disney desserts all the time, but we can make things to remind us of the things we miss. 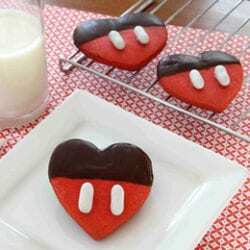 I found a recipe for these cute Mickey Chocolate Dipped Valentine Heart Cookies on Disney Family’s website. Bring a little Disney sweetness to your house!! 1. Knead red food coloring into the cookie dough. Then flatten the dough into a disk and wrap it tightly in plastic. Chill the dough until firm. 2. Heat the oven. Working on a flour-dusted sheet of wax paper, roll out the chilled dough to 1/4-inch thickness. Cut heart shapes from the dough. Bake the cookies according to the recipe directions and then let them cool completely. 3. Melt a cup or so of the candy melts in the microwave according to the package directions. 4. Dip the top of each heart in the melted chocolate (if needed, gently scrape the back of the cookie against the rim of the bowl to remove any excess coating). Place the dipped cookies on a wax paper-lined tray. 5. For the finishing touch, use dabs of the leftover melted candy (applied with the tip of a toothpick) to attach a pair of white licorice candy “buttons” to the lower portion of each heart.